Stock markets seem to have entered holiday mode already, but investors still lots of economic news to digest ahead of Thanksgiving. 1. Economic updates: The U.S. government posts weekly jobless claims at 8:30 a.m. ET. That's followed by the University of Michigan's consumer sentiment index at 9:55 a.m. ET, and new home sales data from the U.S. Census Bureau at 10 a.m. ET. And over in the U.K., a revised GDP reading showed the country grew by 0.7% during the third quarter, unchanged on previous estimates. 2. OPEC meeting begins: Ministers from major oil producing nations begin a two-day meeting Wednesday in Vienna to discuss future oil production plans. The OPEC meeting is poised to be one of the most contentious since oil prices plummeted by more than $100 a barrel in 2008. A decision is due Thursday over whether the producer cartel will cut its output for the first time since December 2008. 3. Google break-up? : European Parliament will debate a possible break-up of Google (GOOGL) Wednesday over concerns that the American tech company has gained monopolistic powers in Europe. On Thursday, members will vote on a resolution that will propose ways to shrink Google's influence in Europe. But even if the vote passes, it'll only be a recommendation. A final decision lies with another branch of the government: the European Commission. 4. Stocks enter holiday mode: U.S. stock futures are inching higher Wednesday, but the gains were small. European markets are mostly edging up in early trading, and most Asian markets ended with gains. The latest reading on the CNNMoney Fear & Greed index shows investors are feeling relatively greedy. 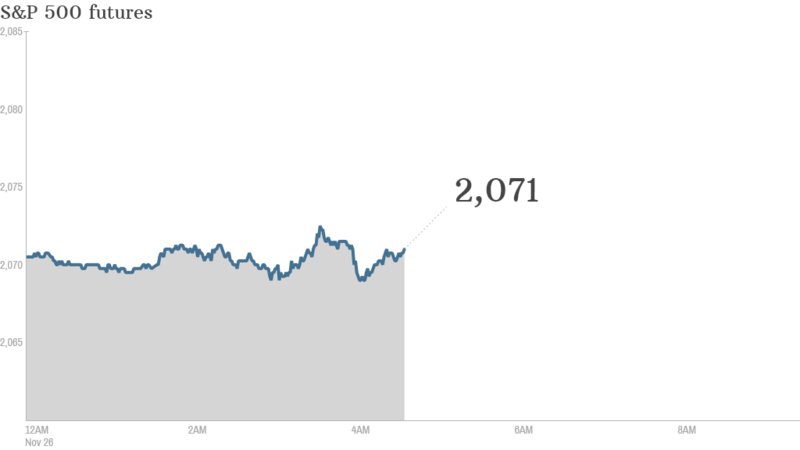 U.S. stocks were little changed Tuesday. The Dow lost about 3 points and the S&P 500 ended 0.1% lower. The Nasdaq edged up 0.1%.